...okay, so maybe Dream Theater was going back to their concept album days. I've been wrong before, I can own up to it. But just so you all have context - my channel has gotten approximately seventeen times bigger than the last time I talked about Dream Theater in a review - when I covered their self-titled record, I made the comment that Dream Theater seemed to be charting a new direction, at least in terms of how they thematically structured their albums. And that made a certain amount of sense - the self-titled record was considered a return to form, charting a new era for the band. But let's get real here: it was only a matter of time before Dream Theater returned to the well of a narrative-driven concept record. Hell, Metropolis Pt. II: Scenes From A Memory, which you can make a convincing argument was their best album, was a narrative-driven concept record, and that was seventeen years ago, so why not go for it again? Well, they definitely did: a double album, over two hours, with a full symphonic backing orchestra and dystopian narrative... but unlike on Metropolis, frontman James LaBrie was going to be playing all seven main characters characters. 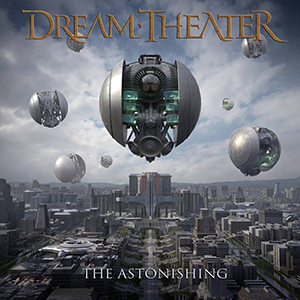 By all accounts, this is one of the most ambitious projects Dream Theater has ever attempted, and with the full support and budget of their label behind them, you had all the reason to believe this could be something really special, from veterans well over twenty years in the industry. Could they pull it off? Well, I'm of a few minds when it comes to this project, the most immediate being that superb musicianship, some stunning arrangements, and Dream Theater making one of the most expensive-sounding and 'epic' records of their career deserves immediate acclaim. And yet, after four or five listens through this behemoth of a record, I'm even more convinced that it should be a lot more memorable and powerful than it is, and a lot farther from Dream Theater's best work than it should be. It's most certainly good and diehard Dream Theater fans will adore it, but I'm not quite certain it's great, or that all of the creative decisions behind this project paid off as well as the band hoped. So let's start by talking about something I normally don't discuss much when I talk about albums: structure. And the first thing I put in consideration is that thanks to its high concept and size and two act structure and usage of repeating musical motifs and style of production that it's more of a rock opera musical than anything else. Seriously, bring in more singers to fill out the cast and I can see this working on stage, which means I'm willing to be a bit more forgiving for the album's length. At the same time, though, it's certainly an album that takes its time, and the similarities in melodic progressions from track to track with the extremely polished production means that there's a fair few songs that blur together and don't really have a unique instrumental identity to stand as their own songs. It's certainly nowhere close to as heavy as Dream Theater has been in the past, which I guess makes a certain amount of sense as this is the first time they've really used a full orchestra, but it also means that a certain amount of visceral power is sacrificed as well. Of particular note is that considering this is a record set in the future that feature noise robots, there's very little usage of sci-fi effects or harsher synthesizers or more electronic elements that would indicate we're over two hundred years in the dystopian future. In fact, given the occasional sound effects that do show up that seem more sword-and-sorcery driven, you could argue the only thing that puts this record in the future is the noise robots, as the record doesn't really do much with the fact that it's set in the future of the United States. And maybe it's just having heard far more abrasive music over the past few years, but the noise interludes weren't that bad at all, almost a little too sanitized. Now none of that is saying that on a compositional level there aren't melodies or passages that aren't potent or have real swell to them: the rapid instrumental change-ups on 'Dystopian Overture', the glossy synth and keyboards on 'When You Time Has Come', the insane guitar and keyboard interplay that opens 'A Life Left Behind' and the fantastic solos on 'A New Beginning', to that gorgeous ragged fiddle on 'Hymn Of A Thousand Voices'. And the power ballads on this record really are damn good: the piano-driven 'Act Of Faythe' that explodes into a much darker song with some excellent drumwork, the gorgeous 'Chosen' with probably one of my favourite hooks on the album, even the fragment 'The Answer' was excellent! It's just the actual metal elements feel softened to the point where it doesn't give the conflict or 'villains' the sort of bite they need to seem truly menacing - 'Three Days' is a prime example, where the threat is completely undercut by a swing-inspired piano line and brass that just feels a little too comical. It gets better on the meatier 'A Tempting Offer' or the more violent 'The Path That Divides' and that opening riff on 'A New Beginning' has some good snarl to it before getting submerged in the rest of the mix, but part of the problem is the usage of the orchestra. You can definitely tell that John Petrucci doesn't quite have the knack for producing for the larger choir, and it often feels they're just a shade short of the swell to really drive them home. It also shows up in the mix balancing - the guitars feel a shade too polished and lacking in grit, the bass a little lacking in texture and meat, and the drums not quite having the punch they need to really hit with impact, with the slightly more faded cymbals not helping. And a big part of this is the vocals. Look, I'm not going to deny that James LaBrie sounds great on this album, and I can appreciate the Herculean effort it took to try and make distinctive and emotive voices for all of the characters he's playing, but it's not like they go for extensive multi-tracking or anything beyond a few filters to distinguish them further, which can make songs where the point-of-view changes hard to follow. And yet for as expensive and big as this record can sound, I'm left wondering why they didn't just hire a few more singers to play these parts, if only to add more distinctive voices to the choir - they don't even need to be big names if you're so terrified of the Ayreon comparison that was going to be made anyway given some of your synth tones, and I'm almost certain they would have had the budget for it! As it is, it makes the story's scope feel smaller, which is the last thing this record needs. Because let's face it: this is high fantasy camp, with a story midway between your average young-adult dystopian novel and your archetypal hero's journey. And for a high concept musical, that can work - hell, it's pretty much the only place where if you play it straight you can get away with how cheesy it all is, providing you go as over-the-top 'epic' as possible. And yet even with that, Dream Theater is pushing it here - I could point out how painfully on the nose the symbolism is in even the character's names, or how the lyrics are almost comically broad, or how the concept of returning music to the world feels like a rejected Disney script, but I'm willing to play along to a point. But it doesn't help matters that Petrucci is trying to give moral ambiguity to every single character which feels both overexplained and thinly sketched. It's probably most exasperating with the villains: the tyrant who uses noise robots and threatens mass slaughter is really just misguided and scared to embrace the music that he's always loved - and his name is the creatively misspelled 'Nafaryus'. Even the brother of the princess who kills the brother of our hero out of jealousy/daddy isuses - a hero named 'Gabriel', for a healthy dose of biblical symbolism - and who mortally wounds his own sister is only deafened before getting his forgiveness. And on the topic of that mortal wounding - and we might as well talk about the pretty thin plot, given how much this album obsesses over it - it compels our hero to let loose such a deafening scream that he loses his voice... which I'd buy except LaBrie's scream really is quite weak here. And yet it somehow so strong that it calls people from around the world and they literally sing our princess back to life. Yeah, this Disney Death is only marginally less ridiculous than when it happened in RENT, and I don't like it for the exact same reason: it's a tension-destroying element, and it does nothing for the stakes of the story if the power of song can beat death. And considering the atmosphere is already pretty thin on this album, it's probably the point that pushes this record away from true greatness for me. So in the end... look, I can respect Dream Theater taking a chance to try something in this vein - frankly, I'm amazed they didn't try it earlier - but I'm not as grabbed by it as I want to be. The compositions themselves are gorgeous, but stretched over two hours of music that's not as well produced as it could be and with a story that never really manages to transcend the camp of it all, I find myself wishing for what might have been, especially when said ideas would have been easy enough to execute. And especially when you place this album up against Dream Theater's best... for me it's a strong 7/10 and a recommendation, but a slightly cautious one, and I honestly don't see myself revisiting this album much in the future. I applaud the ambition, but I find myself wishing Dream Theater had continued on the path I predicted when I reviewed their self-titled album. It might not have been astonishing, but it would have been leaner, tighter, and probably better for it.